Americans throw away billions of individual plastic bottles each a year and the majority of these bottles end up in landsfills - taking up valuable space and leaching chemicals into fresh water tables. The worst part of plastic bottles is the fact they take about 1,000 years to decompose and they use precious fossil fuels to make and transport all over the country. Beyond ecological issues, there is some speculation regarding the actual "health benefits" of bottled versus tap water. Bottled water manufacturers� marketing campaigns capitalize on isolated instances of contaminated public drinking water supplies by encouraging the perception that their products are purer and safer than tap water. But the reality is that tap water is actually held to more stringent quality standards than bottled water, and recent reports have indicated that some brands of bottled water are just tap water in disguise. 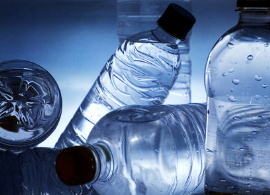 The most commonly used plastic for manufacturing water bottles is polyethylene terephthalate (PET), which is derived from crude oil. Making bottles to meet America's demand for bottled water requires more than 1.5 million barrels of oil annually, enough to fuel some 100,000 cars for a year. But the environmental impact doesn't stop there, because then all these products need to be packaged and shipped and transported all around the country, using even more fossil fuel while releasing pollutants into the atmosphere. The three most common reasons voiced by drinkers of bottled water are healthiness, purity and taste. But controversy exist in this arena as well. The Natural Resources Defense Council, which carried out a four-year review of the bottled water industry some years back, concluded "there is no assurance that just because water comes out of a bottle, it is any cleaner or safer than water from the tap." The report also pointed out that there are a significant number of regulations governing the quality of tap water in the United States (regulated by the Environmental Protection Agency), but fewer, less stringent rules govern the quality of bottled water (regulated by the Food and Drug Administration). So if it really isn't more healthful or technically "purer"-- and the available studies seem to confirm this-- what we're left with is taste, and clearly that is up to each individual consumer. Spring Water - This is water from a natural, protected underground source which flows to the surface unassisted, although it may be collected directly from the source using a sanitary collection method. Well Water - Well water is drawn from a protected well that taps directly into an unconfined aquifer. Purified Water - Purified water is water that has been demineralized after being drawn from either a protected underground source or from a municipal drinking-water supply (public tap water). Artesian Water - Artesian water comes from an artesian well, which draws water from a confined aquifer (an underground, porous rock or sand formation that bears water and is under pressure from a layer of rock or clay above it). The pressure from the confining layer forces the water from the aquifer upward. The level of the water supply the artesian well is drawing from must be positioned above the top layer of the aquifer. Naturally Sparkling Water - Naturally sparkling water comes from a spring or artesian well and the effervescence that is it's namesake typically comes from nature. Mineral Water - Mineral water is simply spring water that has at least 250 parts per million (ppm) of total dissolved solids, or minerals like calcium, magnesium, sodium and potassium, that are naturally occuring at the source. Standard spring water normally has about 50 ppm of these mineral solids. Carafe-Style Water Filters - The most well-known manufacturers of this type of water treatment method are Brita and Pur, which makes pitchers with built-in filters. The filters last about two months and according to their website reduce lead, copper, chlorine (taste and odor) and mercury -- all of which may be found in tap water. Faucet-Mounted Water Filters - The Pur faucet mounted water filter manufactured by Procter & Gamble is a popular alternative, and the company representatives state that each filter can fill the equivalent of 3,200, 16-ounce water bottles and save bottled water users $600 to $1,000 a year. Brita, Aquarian and Aquasana as well as other manufacturers have similar point-of-use water filtration products. Install Home Reverse-Osmosis or Distillation Systems - A somewhat more expensive alternative, but standard equipment in many newer homes due to the popularity of treated water. These are actually not the optimal choice because although they are effective at removing contaminants, they also remove the beneficial minerals that are vital for our health. Use Refillable One to Five Gallon Containers - Buy a refillable water jug that you can take to the grocery or water store and fill for several quarters. Buy smaller sized reusable aluminum water bottles that you can refill from the larger bottle on an as-needed basis. What is the Bottled Water Industry Doing to Help the Environment? Some companies, such as the BIOTA bottled water company, are making a concerted effort to reduce their effect on the environment. Located in Colorado, BIOTA uses a corn-based, biodegradable plastic bottle that the company says, given the right composting conditions, will disappear in 75 to 80 days. The International Bottled Water Association (IBWA), which is the industry's governing association, also are trying to address environmental criticism, through actions such as promotion of industry efforts to reduce packaging. Many industry brands such as PepsiCo's Aquafina, Coca-Cola's Dasani, Nestl�'s Poland Spring, Ozarka and Arrowhead have cut plastic use by 30% with thinner bottles. Although these are all steps in the right direction, they are not real solutions. Every person who reaches for a glass, aluminum, or re-useable plastic bottle of filtered tap water is doing the right thing not only for themselves as individuals but for the global community as a whole. Beyond safety regulations and general consumer misconceptions that are predominately fueled by the marketing efforts of bottled water manufacturers, the other primary accusation against the industry can be summed up appropriately as follows: environmental nightmare.